I’ve spent too much time complaining about the cold and using it as an excuse not to get into the mountains. I absolutely love being in the mountains. The cold didn’t bother me that much years ago, but for some reason in the last couple of years I have just been negative about the cold. I’d love to blame getting older, but the truth is that it has little to do with my age, and a whole lot to do with something else. It’s my attitude. Too often when we say we like this or hate that, it is nothing more than a simple mindset we have formed about something. For some reason, I got my head set that I didn’t like the cold. This year, I decided I would do something about it. I proactively decided to change my attitude about the cold, and more importantly, stop using it as an excuse not to do what I love – trek around in the mountains. So, I bought new snowshoes, bought some other new gear, and pulled out all my cold weather gear. 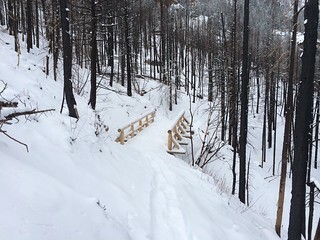 I was good to go, and on Wednesday, February 5th, I headed up to Rocky Mountain National Park for a day of solo snowshoeing. I was up early and started the day at the Beaver Meadows Visitors Center. 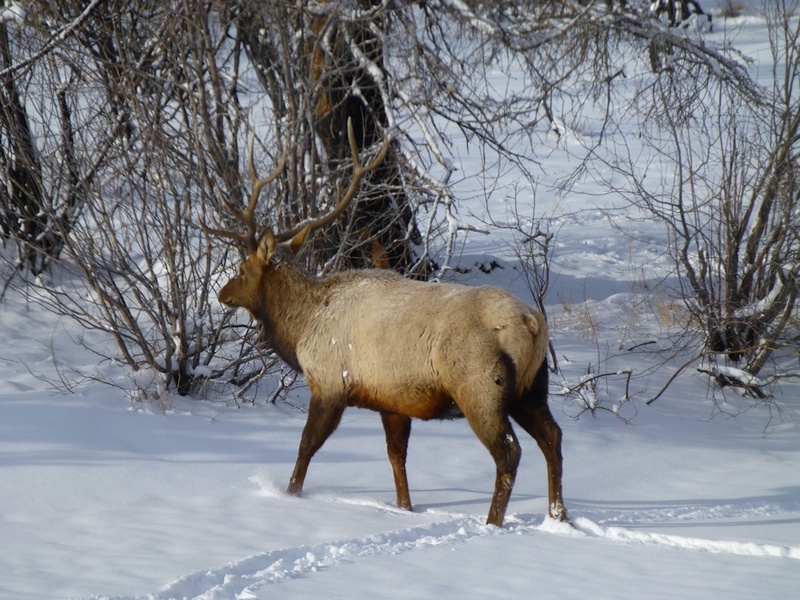 When heading into the Park, especially in the winter, it’s a great idea to check on the conditions with the park rangers. 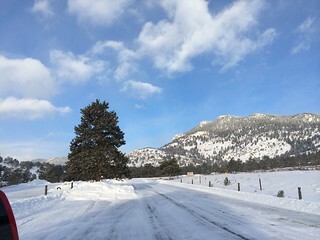 The ranger told me that the snow was a little light on the beginning of my planned trek, but should be great for most of my day. I headed south from the Cub Lake Trailhead. 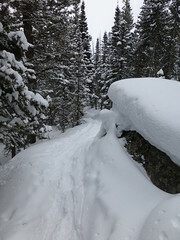 The conditions were a little rocky in places, as there was only about a foot of snow. 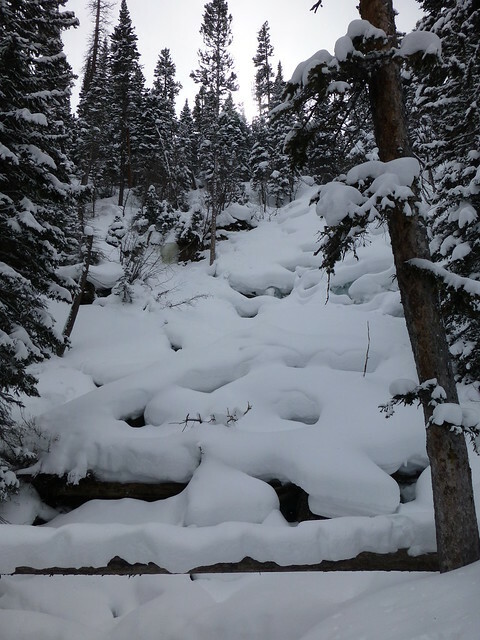 Some rocks were exposed, but for the most part the packed trail was okay for snowshoeing. Once I headed west and began to climb out of the flat valley, the conditions vastly improved. The trail was easy to follow, as many previous visitors had left a nicely packed trail. There was a light snow falling, which made every footstep crunch in the dry snow. 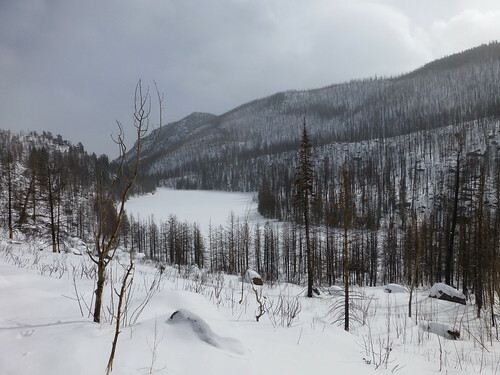 Approaching Cub Lake in the dead of winter is an awe-inspiring experience. It is amazing to look across the lake, which is nothing more than a flat blanket of snow. The wind was beginning to pick up a little, so I decided to head across to the west side of the lake to try and find someplace to have a little snack and to enjoy the beauty of this frozen wonderland. As tempting as it is to walk across the center of the lake, as a solo traveler, I know better. I stayed to the side of the lake, where the water was likely frozen solid. Heading west from The Pool, the elevation change became more pronounced. What is a fairly easy hike in the summertime, becomes a more significant workout with snowshoes. There were a number of times, I considered turning back, but the trail is only one mile, and I was determined to make it to Fern Falls. In the summertime, you can always tell when you are getting close to the falls, because of the roar of the water as it splashes down the rocks and fallen trees. In the wintertime, it is absolutely silence. The falls are frozen. After a wonderful break, enjoying the absolute silence and exhilaratingly clean, cold air, I headed back to the Fern Lake Trailhead. 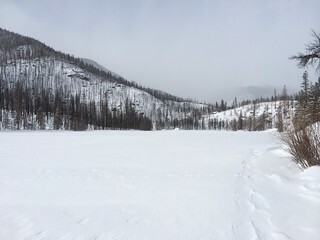 The road between the Cub Lake Trailhead and the Fern Lake Trailhead is closed in the winter, and makes for a fairly easy walk in snowshoes. As with many of my treks in the mountains, I found amazing comfort in the solitude of nature. It is a physically and mentally draining undertaking, pushing as hard as you can. However, it is a truly emotionally and spiritually refreshing experience to be absolutely alone, never seeing another soul the entire day. Please feel free to check out all of my photos from this trek on my Flickr site. That looks like a great trip. I know what you mean about the cold/snow I have used it as an excuse sometimes to avoid getting out.